This is another in the all about me series...now, we're scrapbooking your favorite music. Music has always played a big part in my life, as I'm sure it has for millions across the world. It's my therapy. Better than a punching bag, or even a primal scream, being able to sing along with my favorite songs has made even the worst days fade from memory. So, one day I decided that I was going to make a scrapbook layout about some of my favorite music. 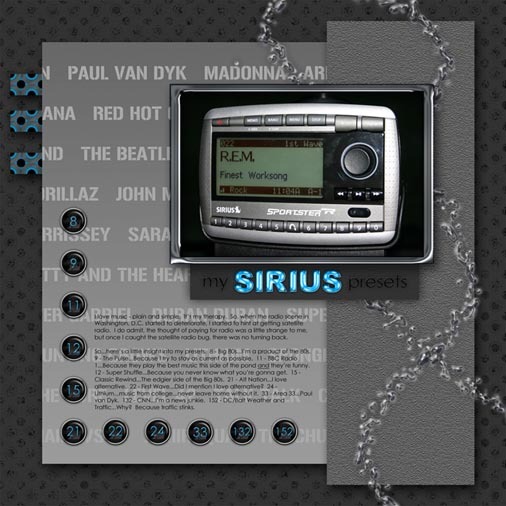 In this example, I decided to scrap the preset stations on my Sirius satellite radio and this is just one of the ways of scrapbooking your favorite music. We all have our favorite radio stations...some more so than other, but they get us through the day (and our commutes). How long have you been listing to it? Is it a talk radio station or does it play music? Is there a particular program that you've listened to since you were a teenager? Why not create a scrapbook layout about it? In today's age of ever changing radio formats, it's important to keep a record of your favorites (while they're still around). Similarly, as I did with my satellite radio layout, you can create a layout scrapbooking your favorite music that describes the presets you have on your regular or satellite radio. Make sure to put the call letters in your layout because 20 years from now, that same station may be playing something totally different. And who knows...satellite radio may be "the" radio of the future and then you'll have a historical record of what radio used to be like. Now, we couldn't talk about scrapbooking your favorite music without mentioning iPods. If you don't have an iPod yet, you probably will soon. These portable music machines have revolutionized the way we listen to and buy music. It's not about CDs anymore, it's about downloading (legally, of course). So, what's on your play list? What songs are currently in heavy rotation? And what does your library of songs say about your musical preferences? I've found, in loading up all my music, that I (1) love alternative and (2) have a serious bias towards British artists. You're probably wondering, how am I going to make a scrapbook layout about my iPod? Easy...just take a picture of your iPod and you can make a simple one-picture layout (click here for some sketch ideas). 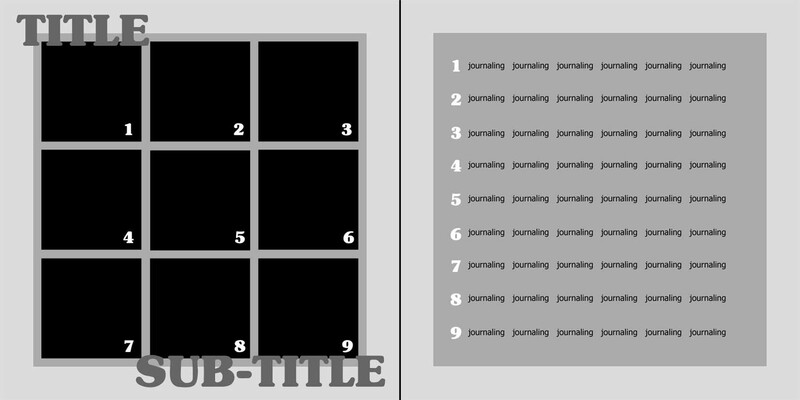 Your layout is probably going to be mostly journaling anyway, so a one-picture layout should do the trick. Scrapbooking your favorite music includes taking a trip down memory lane - no matter how much it might make you cringe. While there are certain artists that I will always love, there are others (New Kids on the Block) that were definitely a fad. How have your musical tastes changed over the years? Which artists/bands have defined certain periods in your life? To me, I can break my "musical life" into three categories - (1) My childhood, (2) My High School Years and (3) My College Years. All of them are uniquely different and all bring back wonderful memories. You know what they are...and if you don't, it only takes hearing the first few notes on the radio to help you remember. They're our favorite songs. We all have them and every time we hear them, we have to crank up the radio as loud as possible and no matter how many times we hear them...we never tire of them. This type of layout is probably best suited for a list format (like this sketch below), but in scrapbooking there never is a right way to do anything, so play around with different options until you find one you like! Some of you may have so many favorite songs, that it will take more than one layout. You may want to break your favorite songs down by decade or incorporate them into your "Music Over the Years" layouts. As you can see, there are a lot of options when it comes to scrapbooking your favorite music. So, now it's time to crank up the stereo...or iPod...or radio and start making your musical memories.